PowerPoint Freebies and Tutorials for Teachers and Students! Students: You want crazy cool eye popping presentations... Teachers: You need better resources to teach and display your knowledge! Start here: Become a Facebook Fan to get the latest Brainy Betty freebies every week! Start here: Become a Blog Subscriber to get new tutorials, tips, tricks and downloads every week! K -12 or for college subjects? Do you know how to make a movie from your digital pictures? Watch this YouTube tutorial and learn how Find pre-made presentations for Educators here. Just customize your own content into these. If you have Microsoft PowerPoint 2010, learn how to play a video in a shape! Very cool YouTube tutorial. SCIENCE FAIR - Presentation Backgrounds and Resources for Your Students! Get animated backgrounds here! The Annenberg Foundation has created a non-profit, multi-media organization called explore.org, which features educational videos that would make great educational aids in the classroom. - Be sure and thank him! Get inspired - see other people's presentations at Power Show and share yours as well! 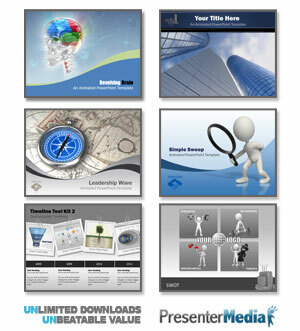 Take the Advanced PowerPoint Graphics course for free - it's an older version of PowerPoint, but the basics are the same!